Genuine wood paneling and veneers have been used for decades, however, for many people, the mere thought of wood panels conjures up images of dark and musty old basement recreation rooms caving under the ominous weight of heavy wood panels, or worse yet, cheap wood look-alikes with gouges, cracks, and faux grains that put real wood to shame. Today there are sophisticated new options for wood paneling, featuring exotic hardwoods and an environmentally responsible approach to their harvesting and manufacture. Yes, wood panels are making a stunning comeback in home interiors. What a difference a few decades make! The rich and varied colors and inherent character of wood give family rooms, dens, and other leisure time living spaces remarkable charm and incomparable beauty. The simple addition of wood panels gives your home a timeless elegance and a warm ambience beyond mere painted drywall. Forest Stewardship Council (FSC) is the world's leading forest certification system. As the need for, and interest in Certified Veneers has grown exponentially, responsible companies are continually expanding their inventory of certified products. The 'think green' consciousness is present through the harvesting process to manufacturing operations with the goal of striving for peak efficiency while minimizing energy consumption and preserving quality standards. The beautiful wood panels being produced by these innovative companies offer an exquisite range of options to enhance your home. People these days demand high quality products that make environmental sense, and that need is being addressed with a premium product that adds instant character and charm to any interior. When shopping for your new wood panels, consider companies which are certified by FSC ensuring that forests are harvested and maintained in a well-managed manner, and that recreational, social, economic, and aboriginal needs are taken into consideration in the process. Cv - clear vertical grain defines pieces which may exhibit a few minor characteristics which do not detract from their high appearance and quality. Limited provisions include very light torn grain, very light skips on the non-graded face, and very light warp. A - A and better clear - this grade is ideally suited to applications where finishing requirements are less exacting. These limited provisions include small seasoning checks, occasional very light skips on edges and backs and allows for two small, sound tight knots or their equivalent. C - C and better clear - pieces of this grade are of sound wood and are entirely clear or have only a few insignificant characteristics such as medium stained sap wood, short splits, small pitch streaks, and occasional small knots. D - D and better clear is the grading for pieces of lumber having one or more characteristics which eliminate them from the C and BTR grade. These include medium stitch streaks, limited pin holes, hit and miss skips, and two knots approximately one inch or their equivalent. TK - select tight knot grading indicates the wood has knots, burls, and naturally occurring markings which are of fairly uniform distribution and add to the decorative character of the piece. There are many online shopping resources for wood panels. Each of them offers superior products, service, and guarantees. Duragroove Products offers pine or cedar paneling. Wood Workers Shoppe offers knotty pine paneling. Buffalo Lumber offers a great selection of wood paneling including knotty pine, red or white cedar, and redwood. Exotic Hardwoods is focused on procuring the most beautiful FSC-Certified veneers from sustainably managed forests, as well as salvaged woods from around the world. 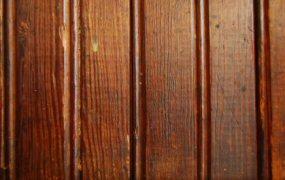 Antique Woodworks offers a stunning collection of reclaimed wood paneling. For a less expensive alternative to real wood, consider the faux wood paneling at Faux Wood Panels. Bear Creek Lumber has a comprehensive selection of wood paneling including Alaskan yellow cedar, western red cedar, douglas fir, pine, hemlock, and mahogany, among others.